The logical square (or square of opposition) seems to be the oldest known opposition structure after Parmenides and Plato‘s non-graphical enquiries on oppositions. If there is no evidence that Aristotle himself, who discovered its underlying logic, discovered this geometrical-logical object (the first known occurence of it appears much later, in the writings of the Latin philosopher and logician Apuleius), there seems to be in Aristotle’s On the interpretation some kind of prefiguration of it, called ὑπογραφή (“hypographe”, that is “sketched drawing”). Remark that this logical square (or “square of opposition”), which summarises very elegantly many of the fundamental laws of Aristotelian logic, was very important during the Middle Ages, where it constituted one of the basis of the education of the students, notably in the universities. 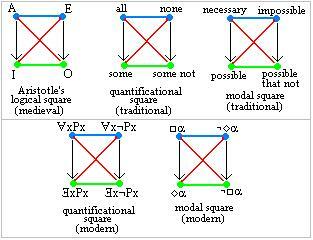 Remark that, as shows the figure here, the square admits different readings (OG speaks of “decorations”): quantificational and modal (in fact there exist many more possible decorations). However, after a long success, the square knew a significant decay, notably with respect to the new logic and to the “analytical philosophers” inspired by (and promoting) this new logic: it is in this context that the discovery of a remarkable extension of it, the logical hexagon (1950) was almost not perceived by the scientific community. Nevertheless, the square was much prised, in the 20th century, by the so-called “structuralist” thinkers, for their theories were very much concerned with the fundamental oppositions ruling their respective disciplines (the structuralist studies founded many disciplines, especially – but not only – in the humanities). Nowadays, by developing the general mathematical theory of which the logical square is only a very particular case, OG seems to be restituting to it its deserved interest, for the logical square constitutes the first step of the special branch of mathematics dealing with oppositional structures. Remark that in the framework of OG Pellissier has demonstrated that the square is a weak (not a strong) 2-opposition. Moretti has shown that the square is, with respect of the general theory of the logical poly-simplexes, a logical bi-segment (so that it can be generalised both in terms of a “logical bi-triangle” – this is Jacoby‘s, Sesmat‘s and Blanché‘s logical hexagon – and of a “logical tri-segment”). Remark as well that the logical square admits a strange relative, that is Piaget’s and Gottschalk’s duality-operational square.